Yes, it’s time for another local deals site. But this one is a bit different from the countless Groupon competitors, because it’s targeting a very specific market: college students. 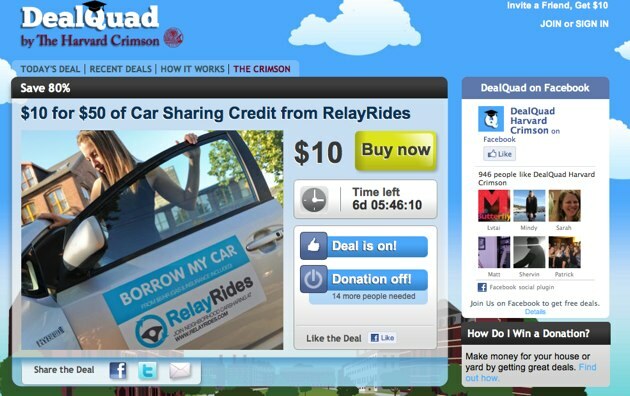 It’s called DealQuad, and it’s working directly with college newspapers to match students with good deals (and help the newspapers stay afloat in the process). Since launching last month, the company has landed deals with school papers at Harvard, the University of Michigan, and the University of Washington. It’s also recently closed an angel round with participation from Paige Craig, Randy Kaplan, and celebrity interactive agency Charlie. So how does targeting this student market put DealQuad in any better position than the countless other Groupon competitors? CEO Jeffrey Appelbaum says that there are a few advantages. First, the student newspapers DealQuad works with already have distribution across the student body both online and in their print editions, which helps clear the first hurdle of getting eyeballs on each deal. They also tend to have relationships with the local businesses around schools, which have staff who can help set up deals (which means that DealQuad doesn’t have to establish a huge salesforce the way Groupon has). The deals themselves are pretty familiar. Students are directed to a branded DealQuad portal from their newspaper’s website or ads in the print edition. They’re asked for their email when they first get to this site, which lets DealQuad send them information about new deals on a regular basis (at this point it’s twice a week, but the company plans to scale this up to the industry-standard daily email). As with Groupon, in order for a deal to take effect it has to reach a ‘tipping point’, which gives students an incentive to get their friends to sign up. A chunk of the revenue generated by each deal (35-50%) goes back to DealQuad and the paper. Appelbaum wouldn’t say how this is split between DealQuad and the newspaper but says that it’s in the paper’s favor. Again, pretty standard. There is one interesting twist though: deals have a second, higher tipping point that’s related to fundraising. Whenever you sign up for a deal, you can associate yourself with a group (this could be a fraternity, club, or charity organization). Then, once this second tipping point is activated, there’s a bit of a competition: the group with the most participants in the deal actually gets a small cut of the revenue generated by that deal. DealQuad is not the first startup that’s looking to apply the Groupon model to college students — we recently wrote about a site called CampusDibs that also does this. The difference, at least so far, appears to lie in the sort of deals the companies are offering. DealQuad’s deals are primarily focused around local businesses, while CampusDibs deals appear to focus more on widely available products that appeal to the youth demographic. In another unique twist, the DealQuad team is also trying to educate the students working for their newspaper partners. The company holds regular interactive webinars to explain the group buying process and why the model works, with input from Chief Strategy Officer Randy Hlavac, who has been a marketing professor as Northwestern’s Medill School of Journalism for 18 years. Of course, college students aren’t really known for having a ton of disposable income. But Appelbaum says this plays in the company’s favor — students are always looking to save a buck, and since DealQuad is offering local deals at places they’re nearby and possibly shopping at anyway, this could be a good way to help them save money.